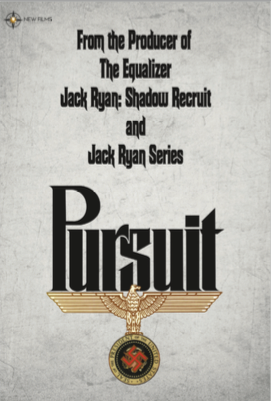 Synopsis: From the producer of The Equalizer, Jack Ryan: Shadow Recruit, Jack Ryan Series, Patriot Games, Clear and Present Danger, and The Hunt for Red October comes PURSUIT, an elevated, high-concept blockbuster. In the spring of 1944, the Nazi high command knows that the war is all but lost, and they launch a desperate attempt to crush the Allies’ morale and turn the tide. They spring Monck, a German assassin from a prisoner-of-war camp in Washington state. His target: Franklin Delano Roosevelt. A Secret Service agent, John Wren, uncovers the escape and tracks Monck across the American home-front from the Pacific coast to Washington, DC in this tense and relentless action thriller. Based on the book written by James Stewart Thayer.